Everyday Vegan Eats: Recipe + Giveaway! 5/23/14 update: THIS GIVEAWAY IS NOW CLOSED. Thank you to all who entered! 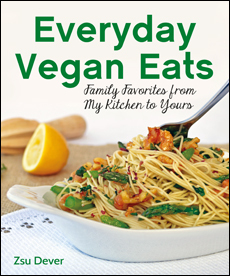 I’m super-excited to be part of the blog tour for Everyday Vegan Eats by Zsu Dever, not only because Zsu is a longtime recipe tester of mine and I’m thrilled to see this talented lady’s recipes in print, but also because my husband’s company, Vegan Heritage Press published her new cookbook. 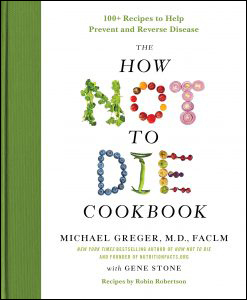 And what a great cookbook it is! Like the other blog tour participants, I’m also hosting a giveaway for this book (details below). Be sure to increase your chances to win by entering all five giveaways! The recipe from Everyday Vegan Eats that I’m sharing with you features quinoa and fresh herbs. I love this recipe because I’m always looking for an easy and delicious way to serve this super-grain and I’m also keen on any recipes that uses more than one herb to pack a real flavor punch. 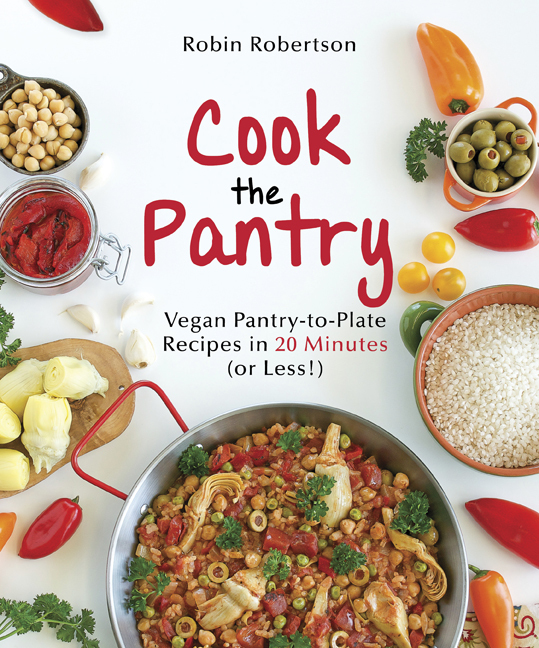 Another thing I like about this recipe is its versatility – you can add cooked (or canned) chickpeas or cannellini beans for extra protein, or even some sautéed tofu or seitan, and add in some extra veggies, if you feel like it for a fabulous one-dish meal. It’s equally good served cold or room temperature as a salad (with a drizzle of olive oil and a little lemon juice). Try it yourself and see what I mean. 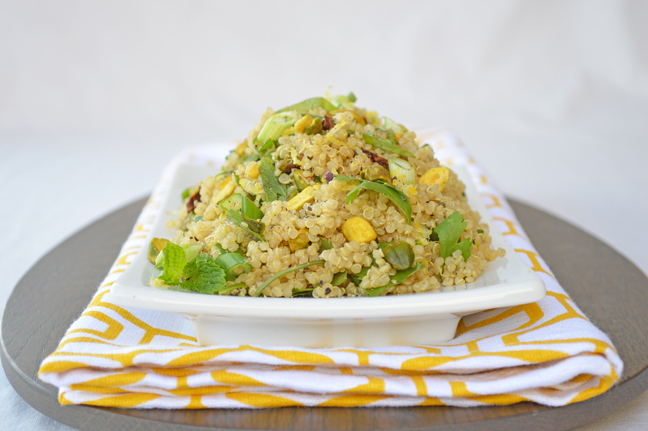 And don’t miss Zsu’s quinoa cooking tip in the headnote! Most recipes call for cooking quinoa in a 1:2 ratio—1 cup quinoa to 2 cups liquid. This leads to soggy and over-cooked quinoa. This recipe produces fluffy, tender quinoa. If your package of quinoa doesn’t specify that it is rinsed, make sure to rinse it well in a fine mesh strainer. 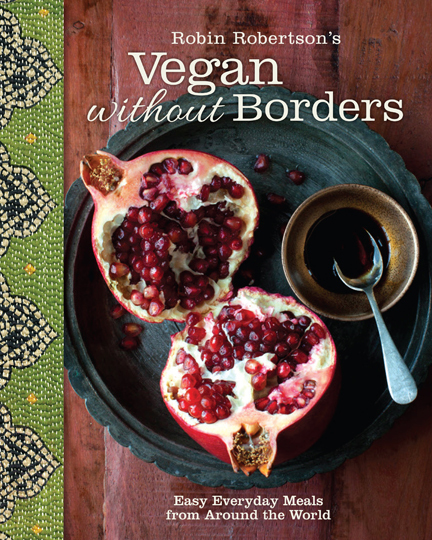 This recipe is from Everyday Vegan Eats by Zsu Dever © 2014, Vegan Heritage Press. Combine the rinsed quinoa, broth, 1/4 teaspoon sea salt and 1 clove minced garlic in a medium saucepan. Bring the broth to a boil, reduce to a simmer, cover, and cook for 15 minutes. After 15 minutes, remove the saucepan from the heat and set the pan aside, still covered, for another 10 minutes to steam. Fluff the quinoa with a fork. Add the scallions or chives, parsley, basil, mint, tomatoes, oil, zest, lemon juice, and nuts to the quinoa fluffing the mixture with a fork. Add additional lemon juice, salt, and black pepper to taste. Two for One Cookbook Giveaway: Since there are already lots of giveaways going on for this book this week, I decided to “sweeten the pot” and host a double giveaway! 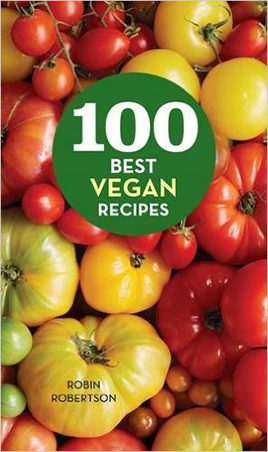 One lucky winner will receive TWO books: a copy of Everyday Vegan Eats by Zsu Dever PLUS a copy of my new book, More Quick-Fix Vegan. That’s a lot of great recipes in one prize. To enter, leave a comment at the end of this post listing your favorite “everyday” meal. That’s it! A winner will be chosen on Thursday May 22 at midnight and announced on my blog on Friday morning, May 23. Good luck! Spaghetti Alla Checca (my husband prefers over Capellini) with zucchini and either home made vegan Italian sausages or Field Roast brand. I love cooking with fresh herbs, have planted already for this summer and have just started to enjoy there wonderful flavors so was excited to see the recipe that accompanied this post. Looks yummy. In a pinch, my go -to meal is pasta tossed with EVOO, garlic, and red pepper flakes. Salad on the side makes it a whole meal! 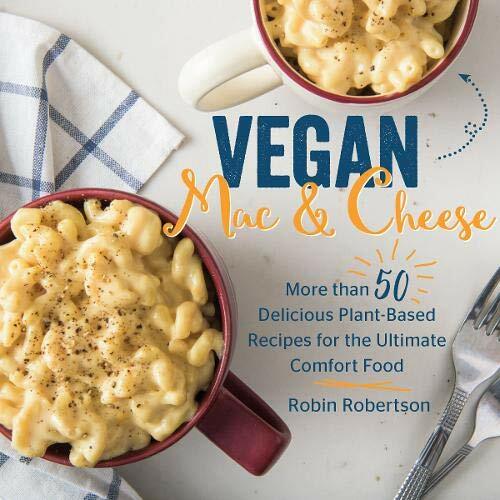 My quick meal would be a commercially-made vegan burger (current fav is a Malibu Burger) with fixings, a green vegetable or salad, and oven fries (see Robin’s “Meat & Potatoes” cookbook). I can assemble this without thinking. My dad’s favorite quick meal has been beans and rice for over 60 years! I love that combo, too, and like to mix in some salsa or other spices to make it colorful and even yummier! My favorite quick fix is a giant salad with lots of crunchy things in it! Tacos! It’s such a great everyday meal that is easily put together. Whatever beans I have on hand, combined with some spice and seasoning. Toss in a few mushrooms if their hanging around, peppers, onions. So simple and so delicious. Wraps are so quick and easy! In the center of the wrap, I pile thin-sliced baked tofu, cucumber, halved cherry tomatoes, thin wedge segments of onion, fresh baby spinach leaves, and the secret ingredient, bread and butter pickle coins. Roll it up, fold the end under, and enjoy the freshness! I love West Coast Chili from your book Vegan Planet. This was my first vegan cookbook and 1000 Vegan recipes my 2nd they r both so worn and tattered from overuse I almost bought the new versions! My go to meal is pasta primavera with lots of veggies and the Hurry-Up Alfredo Sauce from Vegan Yum Yum by Lauren Ulm. Wholewheat farfalle with wine sage sauce and peas. One of the top 5 in my house! What a great giveaway — both books look amazing!! 🙂 My favorite everyday meal is a quick tofu stir-fry with veggies (usually broccoli and red onions) and brown jasmine rice (precooked from my freezer :)). Yum!! My favorite everyday meal is angle hair pasta with capers and kalamata olives in a freshly prepared marina sauce. So delicious! I can’t wait to try this! Great giveaway! I’ve been wanting this book! Steamed vegetables, salad with whatever I have on hand with nuts/seeds, and a grain dish. What a great giveaway . 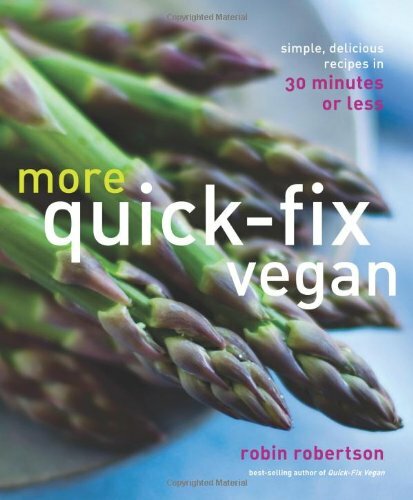 . . Quick Fix Vegan is one of my favorite cookbooks so ‘more’ would be even better. 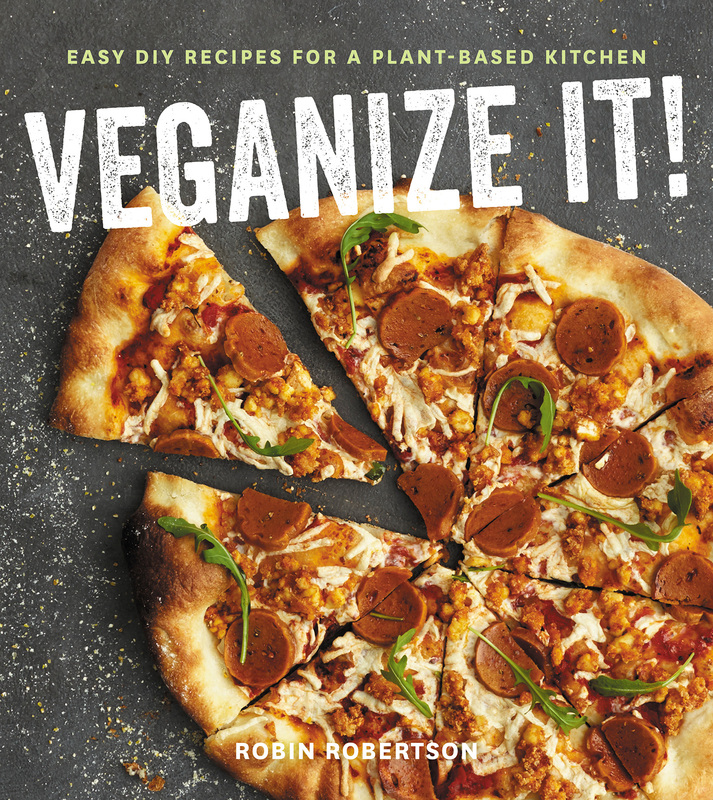 And I’ve been hearing so many great things about Everyday Vegan Eats. My go to ‘everyday’ meal is soup made with whatever veggies and beans I happen to have around. Our go-to meal lately has been roasted veg with lots of herbs, some sort of grain (usually quinoa), and occasionally some baked tofu. With the weather warming up though, we’re going to need to find something that doesn’t require the oven! My husband and I love lentil bowls with a variety of roasted veggies and some tempeh or homemade seitan. For an extra twist, we ladle some of your cheeze sauce from Vegan on the Cheap atop everything. Soooo good! I’m so excited for a chance to win these great books, as I’m trying to change my diet and go gluten free. It’s so hard to find great recipes that my husband will eat as well since he’s a meat and potatoes guy. My favorite every day meal is breakfast. A great breakfast can make for a wonderful day. For a really quick one I usually make a vanilla yogurt parfait with homemade granola, dried fruit and a drizzle of our homemade maple syrup from our tree sap. In warm weather my “go to” meal is salad greens topped with any raw or cooked veg I have on hand plus beans, tofu or tempeh. In the winter I’m more of a bowl person. Mine is veggies and hummus in a tortilla. I would love to have some different options. Thanks for the chance! Judging from the contents of my freezer, varieties of lentil soup are my favorite – I’ve got a straightforward version, a Middle Eastern-inspired version with lemon juice, and a smoky version with Kalamata olives in there at the moment. I eat beans almost every day so black bean veggie soup is a favorite. Usually I have quinoa or buckwheat on the side also. I like vegetable stir fry and quinoa. My favorite everyday meal is pasta & salad. Easy peasy! A favorite “everyday” meal for me is blackeyed peas and rice with a little cholula sauce. Then I add a salad or some cooked greens and a few tomato slices if I have some. But speaking of quinoa, I made some last Sunday and have been mixing it with beans and greens for a couple of this week’s lunches. A gigantic portion of my culinary life revolves around beans, it seems. Beans and rice, beans in soup, beans in curry, beans in spaghetti sauce. So, I’m going to say a perfectly seasoned pot of beans is my everyday meal. My everyday meal varies by season, giant salads when it’s warm and soup when it’s cold. Thanks for the chance to win 2 great books! My favorite “go to” meal is a good old peanut butter and jelly sandwich! My everyday meal is a bowl with rice and whatever veggies I have on hand. ziti and coconut curry rice. Yum! Thank you so much! My absolute favorite everyday meal is some kind of delicious stir-fry with tofu and loads of veggies. I like to mix up the sauces. I love your peanut sauce the most! Thanks!! Probably cold sesame noodles; so easy and fast! Great giveaway! Beans and rice with any leftover veggies in the fridge tossed in! Potato salad for me! With lentil or mung bean sprouts. I make a quick soup with veggie broth and various veggies. My favorite everyday meal is a big ol’ salad with plenty of veggies, whole grains, beans, and mixed greens tossed in my famous Liquid Gold Dressing. Yum! Mac and cheese (with a cashew/nooch based sauce) and lots of kale! Though I have so many cookbooks I am cooking through, I am always making something different! Really, the one thing I have most days is a green smoothie. My favorite everyday meal is a large salad with beans and brown rice. Whole wheat tortilla shells, ff refried beans, homemade salsa, a little chopped avocado. Every day, always good! I love a peanut rice noodle stir fry with lots of veggies! My favorite everyday meal would probably be any of my soup recipes, though my favorite (minestrone) is definitely too labor-intensive for every day! I wash all my produce over the weekend, so during the week I throw some veggies and seasoned tofu together for a quick meal! We make a super-simple udon noodle soup that my 3 and 5 year olds love. Veggie broth with sauteed ginger and scallions then whatever veg we have around – broccoli, cauliflower, carrots, etc – and some udon noodles. And then we top it with bean sprouts, cilantro and sriracha. So easy and tasty. Tomato-basil soup with some whole-grain bread on the side! love your books! I have two already!! My favorite thing right now is a green smoothie with soy milk, almond butter, frozen banana, a splash of maple syrup, flax seeds or hemp seeds, two big handfuls of super greens and a heavy shake or two of cinnamon! This smoothie rocks! I have one almost every day and I have it for breakfast or lunch. I do something that I call “balsamic braised chickpeas”. Onions sauteed with garlic, can of chickpeas and diced tomatoes added, along with thyme, basil or oregano, salt, pepper and balsamic vinegar. Serve over yummy rice. Add greens if desired. One of my favorite, quick fix meals is a Coleslaw Medley: shredded green cabbage, shredded purple cabbage, grated carrots, sliced green onions, chopped kale, sunflower seeds or pine nuts, tossed with a bit of sweet poppyseed dressing. Light, fresh, crunchy and totally delicious! Chopped salad… it’s so versatile! My go to quick meal is a mixed berry smoothie with almond milk, hemp protein powder and a bit of agave syrup. Yum! Fave everyday meal is tofu and veggies and a bit of broth (I’ve been enjoying Trader Joe’s Soy Ginger broth for this purpose) and lots of herbs and spices quick-cooked in the magical Instant Pot electric pressure cooker. All done in minutes and SOOOOO tasty. Beans and rice! I cook several types of dried beans in the slow cooker, and freeze them in 1- 3/4 cup amounts. And I always have cooked rice in the refrigerator. Then I blend up a quick sauce, and we’re ready to eat. I love a good tabouleh. I make mine with quinoa and sunflower seeds to increase the protein content, add colourful veggies such as sweet peppers, cherry tomatoes and eat it with a side of home-made hummus on rye crispbread. Happiness on a plate! We really enjoy Thai curry with tofu and jasmine rice or quinoa. We purchased some powdered Thai spice rather than the paste recently that really makes it delicious along with the crushed Kaffir lime leaves. Beans and rice with whatever vegetables happen to be around! Thanks for the contest! My favorite quick meal is refried bean/veggie quesadillas and rice. I always keep these ingredients on hand. My favorite everyday meal is breaded baked tofu nuggets. My almost five year old son loves these too , so win, win. I serve these with oven fries and c home made coleslaw. I love to make lentils with kale and lots of other veggies! My go-to quick and easy everyday meal is avocado, mashed with red pepper flakes, salt, and lemon juice – on a whole wheat English muffin topped with sprouts and sliced tomatoes. Yum. One of my all-time favorite recipes – even when not vegetarian/vegan, is a short of risotto withe fried onion til soft with currypowder, ad green peber, and sour apple and veg. stock and basmati rice. I love that 🙂 And I’d also love to win the books. My husband and I love to make salad rolls – they taste so good and so fresh and are our go – to when we are busy during the week. I simply place the wrappers in water before I leave for work and all we have to do when we get home is cut up the carrots, cabbage, lettuce, cilantro and whatever else we are putting in them and then roll them up. It’s a nice few minutes we can spend together after hectic days prepping them tgether and then enjoying the fruits of our labor! We make a really great sauce to dip them in out of tahini, coconut aminos, garlic, and lemon juice! Sooo good! My favorite throw-together dish is a “fridge hunt” — start with a base of one or two cans of beans, add splashes of cumin, chili powder, favorite spices, Worcestershire sauce, fire-roasted tomatoes and anything else that calls for inclusion from your vegetable drawer! Cook it up and enjoy! Kale salad is a recent favorite everyday recipe. 2 beautiful new cookbooks!!! I’d love to receive them as a gift. My standby is beans, greens & a grain mixed with salsa. There are optional toppings depending on the variety of the basics. Always easy & delicious! Baked ziti and garlic bread! I love to throw together sautéed mushrooms, onion, garlic, and carrots with cooked brown rice and a splash of reduced sodium tamari for a quick, nutritious meal. my after work go-to is whole wheat pasta, cannellini beans and sauteed swisschard. Quick, tasty and filling! My favorite go-to meal is brown rice with some nice veggies and a salad with whatever I can toss together, sprinkle with squeezed lemon, orange or some balsamic vinegar. Mac’n’cheeze is probably my fave. Easy and easy to change up! Kim chi is my latest fave addition. Clean and simple…mixed field greens, avocado, green onion, pearl tomatoes, carrots, celery, capers, chopped dates, ground toasted sesame seeds and nutritional yeast (I call it SMOOCH as it’s like a kiss for your salad!) fresh lemon juice, and bit of grape seed oil or a little coconut oil. Toss and plate around a cup of brown rice….It’s my favorite!! pasta with lots of tomatoes, olive oil, garlic, pine nuts, rosemary and thyme, sometimes I add some mushrooms in. 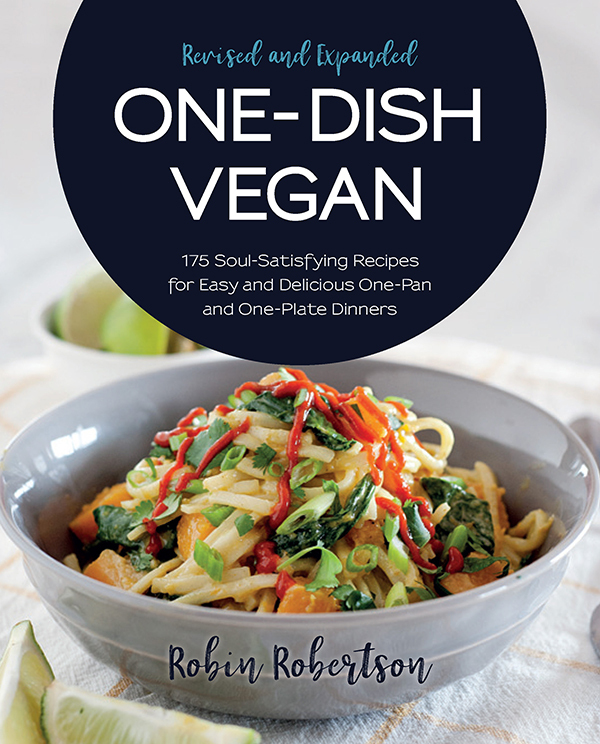 I adore (yes, adore) your bok choy tahini udon noodles from Quick Fix Vegan. Is hummus a meal? I can eat that stuff everyday. With fresh pitas, raw veggies and olives, I call it a meal. We just had polenta and pinto bean pie and then pineapple-apricot couscous cake just last night: all from Quick-Fix Vegetarian. Yum! Home fries with hot sauce….yes!!!!! Greens…of all sorts. With which ever veggies are appealing at that particular time. Sometimes eaten as a cold salad…sometimes as a “skillet salad”. Smoothies…so many choices of ingredients…though a handful or two of greens always. ???????? i like to use up left over stuff that is just sitting in the fridge. a lot of everyday meals that i use to get rid of left overs is a phat salad or big tasty tacos! The opportunity to win both books would be uber exciting. The recipe ideas are tantalizing me and motivating me to cook some deliciousness. YUM. Am impressed with all the innovative ideas. Much Success!!!!!!! My favorite meal that I like to have every day is oatmeal with dried fruit and chopped walnuts for breakfast. Breakfast is my favorite meal of the day. Fast and easy. plus whatever herbs i have growing! Thanks for offering the giveaway! Polenta or quesadillas are some of my everyday quick meals. Anything with avocado is my ‘go-to’ food. Sandwich, salad or just plain guac and chips. One of my go-tos on nights I don’t want to cook are baked potatoes with mushroom gravy and steamed broccoli. My “go to” meal when I can’t think of anything is scrambled tofu with a few sautéed mushrooms & onions along with curry & turmeric. I put it in a garlic, pesto wrap with some homemade salsa. Yummy. My quick fix is a salad or a bowl of fruit. My boyfriend’s is a grilled cheese sandwich or hot dogs. Years ago, a friend created a pasta dish in honor of my husband. With a couple of tweaks to make it vegan, it is one of our absolute favorites, and so easy to throw together – rotini, broccoli, lemon juice, garlic, olive oil, pepper, and some chopped tenders bits. Such an easy and delicious one for those nights when suddenly it’s dinnertime, and we haven’t prepared anything! Love your peanut sauce! I use it on tofu and pasta all the time. Pasta and roasted mixed vegetables topped with warmed fresh tomatoes. Rice and beans with steamed veggies – I never get tired of it! Looks like a beautiful book! Thanks for the giveaway. Robin, I love your pasta fagioli recipe. It’s so easy (I do cheat, using store-bought stock), but on a chilly night there’s nothing like a hot bowl of pasta fagioli with a glass of red vegan wine! The recipe is from Vegan Planet. Thanks for the quinoa tip using less water. I like it 2:1, but I’m going to try this, as it does seem it will be nice for lighter salads! My favorite every day meal is a big, huge, dinner sized salad. So good! My favorite everyday meal tends to change every so often… but my “go-to” is to throw some garbanzo beans on top of brown rice and dress it with some sweet soy sauce and a sprinkle of seasoned rice vinegar… a fast and tasty lunch! A quick stir fry with tofu/tempeh and veggies! 🙂 Thanks for the giveaway! I love a giant fresh salad with a simple light dressing. YUM!! Seitan bourguignon made with your simple seitan and roasted potatoes or a salad. Yum! I love me some dirty rice! Everyday Meal? Well, it used to be pasta dishes but I have to say this week it’s creative salads since I’m doing RAW WEEK! Prior to that and Post Pasta Dishes I would have to say Quinoa Dishes or Rice Dishes (non-white-rice…wild, black, brown, multi, etc!) I know BOTH books would help me broaden my Every Day Meal Vocab and open my eyes to some great new dishes! creamy kale salad….fried rice…noodle soups! Kale salad with avocado and lemon dressing! Greek yogourt. I use it a multitude of ways – smoothies, shakes, cream sauces, salad dressing. SO versatile! 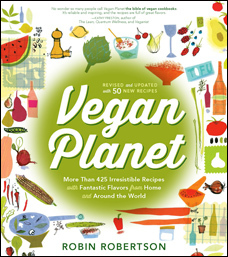 My favorite everyday meal is the sweet potato and black bean enchiladas from ‘Vegan Planet’. I have the ingredients list and recipe memorized so in a pinch I can stop at the store and pick up everything I need even when I didn’t already have a plan for dinner that night. I also make it for all my family dinners because even my non-veg family members love it! I could eat lentils and rice everyday. And I do eat it most days. My favorite everyday meal is whole grain or whole wheat or brown rice pasta tossed with broccoli or sauteed spinach and mushrooms with garlic and non-dairy cheeze (or nooch). yum! My favorite everyday meal is grains, beans, and veggies with a sauce. Pasta with Marinara Sauce, lots of veggies, and warm French bread for dipping. Brown rice, black beans. & sliced avocado is one of my favorite. So easy & simple! A quick taco bar with steamed corn tortillas, beans, onion, tomato, leafy greens, avocado, and lot’s of salsa. My favorite quick meal is beans and rice. The cookbooks look amazing.